Boxlock - A type of action for a break-open gun where the lockwork is contained within a box-shaped housing. 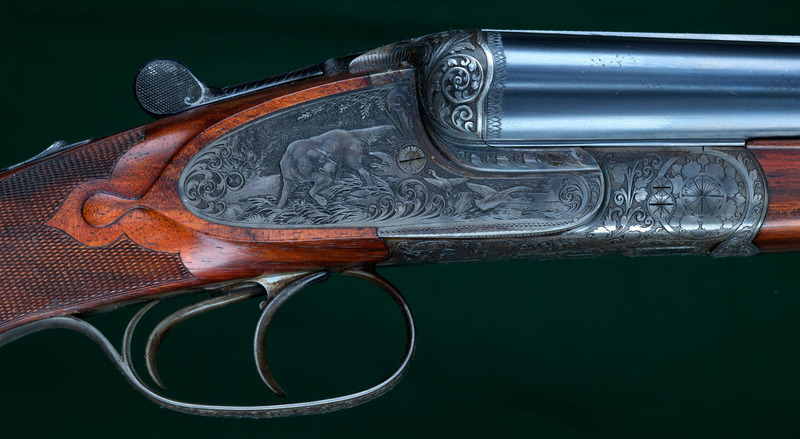 A boxlock is superior to a sidelock because, although more metal needs to be removed from the action body, less wood needs to be removed from the head of the stock---and wood is generally more vulnerable than metal. 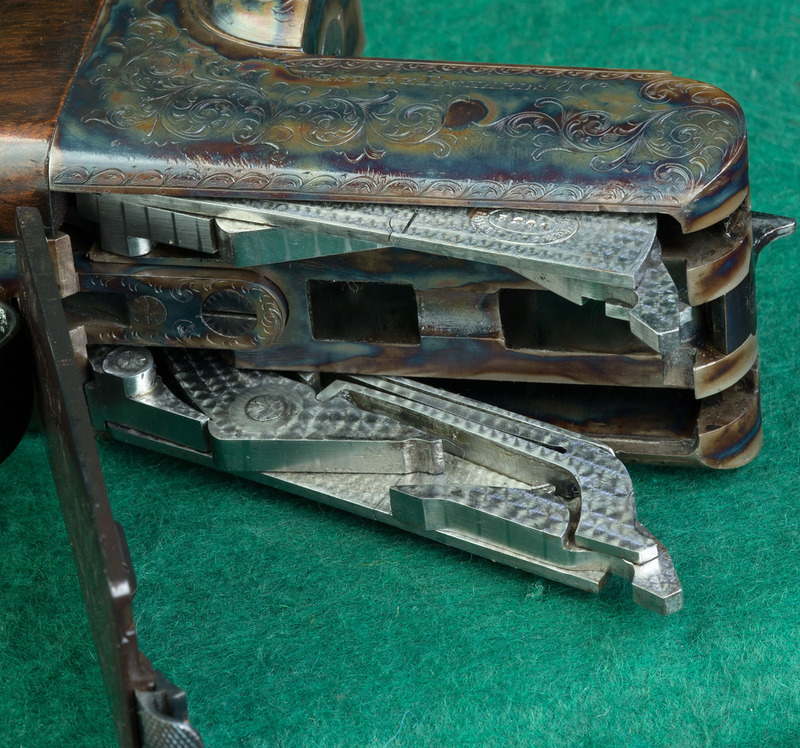 The Anson & Deeley boxlock, patented in 1875 by two employees of Westley Richards, William Anson and John Deeley, the simplest, most reliable and most successful action design, is identified by two pins spanning the width of the action, one at the bottom rear and one slightly forward and higher, upon which the sears and hammers, respectively, rotate. A third axle, forward on the bar of the action, provides a fulcrum for the cocking lever. Dropping the barrels forces the cocking bar (A) upwards, cocking the hammer (B), held in place by the sear bar (C). Close the barrels. Pulling the trigger pushes up on the rear of the sear bar (C) releasing it from the notch in the hammer (B), firing the gun. An Anson & Deeley boxlock action. A removable Anson & Deeley lock, removed from the [boxlock] action. The concept designed by Westley Richards for ease of inspection, drying, cleaning or repair. 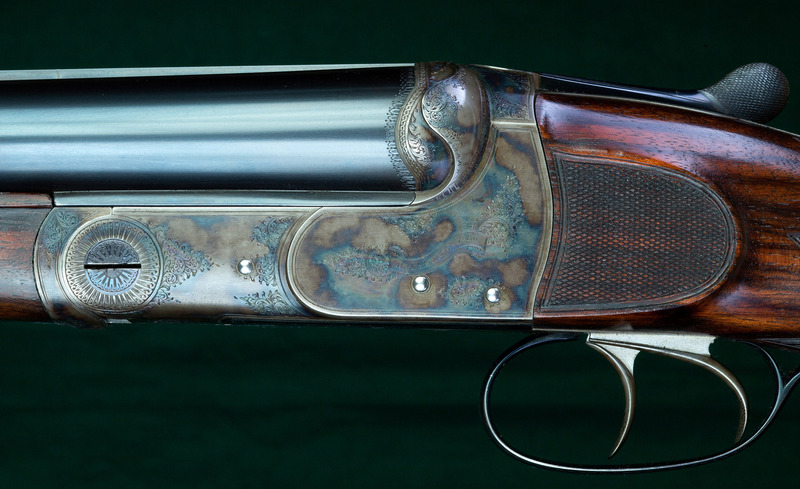 A boxlock, with decorative sideplates to mimic a sidelock.